Even someone as mild-mannered as Justin Bieber has a breaking point when it comes to the paparazzi. Bieber and girlfriend Selena Gomez were at a Calabasas mall Sunday when they encountered a photographer, who tried to take their picture. According to the police report, Bieber and the photographer then got into some sort of physical altercation, during which Bieber lost his shoe and his hat. 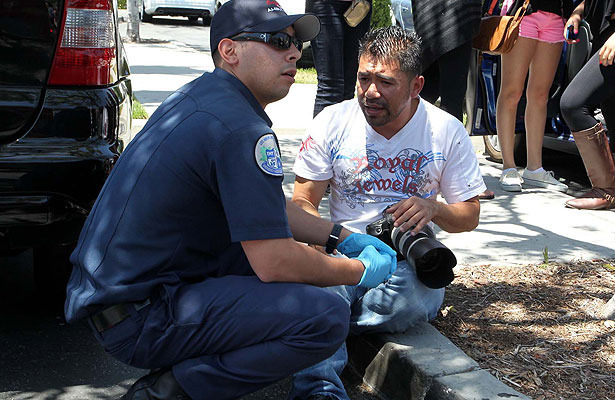 The paparazzo called 911, but Bieber and Gomez left before the authorities arrived. Witnesses said that the photographer was blocking Justin's car as the singer was trying to leave, reports TMZ. The 18-year-old got out of the car and asked the guy to move away but he wouldn't, and a scuffle ensued. The cops are investigating the incident as a misdemeanor battery and are looking to speak with Bieber, Gomez and any other witnesses.